Background: Endoluminal full thickness gastroplication has been shown to have significant and long lasting improvement of GERD symptoms and health related quality of life (HRQL) with very little patient morbidity. These treatments, however, are criticized for normalizing esophageal acid exposure in only 30 – 40% of patients treated. We hypothesize that there are objective criteria that will identify those patients who will have a normal DeMeester score following endoluminal treatment. 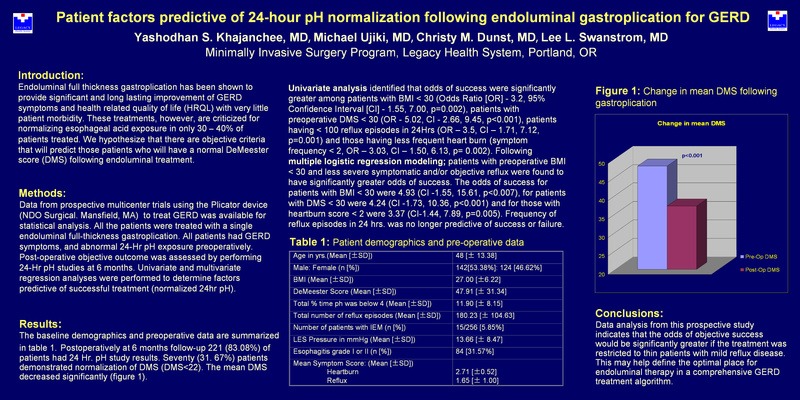 Prospectively gathered outcomes data was statistically analyzed to identify those patients who would be expected to have a normal 24 hour pH study post endoluminal treatment.